I’ll blog more about the value of being a homestay family in another post, but today I’d like to touch on our visit to Hiroshima Peace Memorial Museum. I accompanied the student there on Sunday, before his group departed. Lulu and Roy wanted to tag along, but I had to leave them at home—the horrific reality of an atomic bombing isn’t something a lighthearted child needs to see. Even for adults, it’s a daunting experience. As many times as I’ve been to the museum, each visit hits me hard—maybe more so now that I’m a parent. And the display I find most haunting is a rusty, scabby old tricycle. I’ve lived in Hiroshima for 16 years, but it still feels strange to be surrounded by so much death. In fact, for the past 10 years I’ve touched the horror of the atomic bombing continuously through my work as a writer. Putting the hellish firsthand accounts of A-bomb survivors into English is inevitably a moving task. No matter where you sit, politically, with respect to the atomic bombings (and I, an American myself, can see both sides of the endless debate), the human toll, on the ground, is deeply disturbing. The little boy who once rode that tricycle was nearly four at the time the A-bomb exploded above Hiroshima. His name was Shinichi Tetsutani, called Shin. He was riding his tricycle outside when the blast buried him under his toppled house. His father found Shin still clutching the handlebars, barely alive. The boy died that night and his father buried him at home, along with his tricycle. Forty years later, his father dug up Shin’s remains to give him a proper burial at a cemetery. 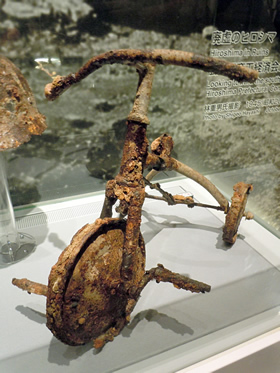 The tricycle, now covered in rust, was then donated to the museum. Fast forward 64 years from the time of the bombing. When my son Roy was two, he was running up ahead of me one day, oblivious to life’s dangers, and closing fast on a perilous corner where a wall to the left of us made it impossible to spot passing cars. As fate would have it, he did stop, right at the edge of the wall—and a second later, an SUV barreled past him. Roy, now five, has no memory of this moment, but I know I’ll remember it forever. The fact that death has become a pretty constant presence in my life—due to my professional activities in Hiroshima and this personal incident with Roy—can have a depressing edge, of course. But more than that, and oddly enough, this mindfulness of death—particularly death that may strike at a moment’s notice—has helped me to appreciate life. I realize this philosophizing may seem removed from raising a bilingual child, but the idea of “seizing each day” is at the very heart of our challenge. After all, a child’s bilingual development is a long-term process, but it’s a process that can only be advanced bit by bit, day by day. By appreciating each day a little more, I think it’s possible to give a better effort when it comes to the daily demands of fostering the bilingual ability of our kids. At the same time, and more importantly, appreciating each day will enable us to love our children even more madly, for as long as we’re blessed to be with them in this world. How about you? Any thoughts after reading this post? What helps you remember to “seize the day”? This is such a poignant and sobering post. And that tricycle… Poor poor Shin.